After 2 years in the making, we’re proud to offer another original; welcome to the next generation of Kratom "Gold" Powdered Extract! Despite not being for consumption, this new product is crafted to ensure the highest purity and consistency, dissolving completely in any liquid as evidence of its purity. 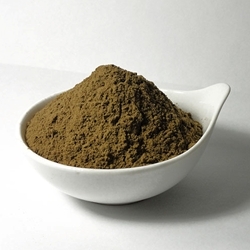 Also, due to the unique drying process that occurs in an oxygen-free lab environment, this Kratom 20x Powdered Extract is extremely light and fluffy, often taking up THREE times as much space as standard extract. In terms of dry weight, what this means is this: A ½ teaspoon of typical extract weighs about 1.5G. A ½ teaspoon of this product weighs only 0.5 grams! And, as with ANY of our Kratom Extract Products, you are completely covered by our 100% Satisfaction Guarantee. Our new Kratom "Gold" 20x Powdered Extract Resin sets a whole new standard or quality and purity, and we stand behind every package we send out of it. We craft this product in small batches, with constant stock turnover. So, none of our Powdered Kratom Extracts sit for more than a week, two at most, as the production is constant. That means the Bali Kratom Powder we make our Kratom Powdered Extract Resin from is the freshest available. We only select Kratom growers who can consistently pass the stringent requirements for food-grade products, which includes no harmful pathogens, low mold and yeast content, low bacteria count, and of course, no dangerous pathogens such as E. coli. All of our Kratom is verified authentic by Columbia or Wonderland-Labs, and we only choose the highest quality Kratom leaf and powder from verified sources. Nearly 2 decades in business, we have a wide variety of sources, and only the best sources make it through our strict screening process. Why trust Powdered Bali Extract 20x Resin from anywhere else?